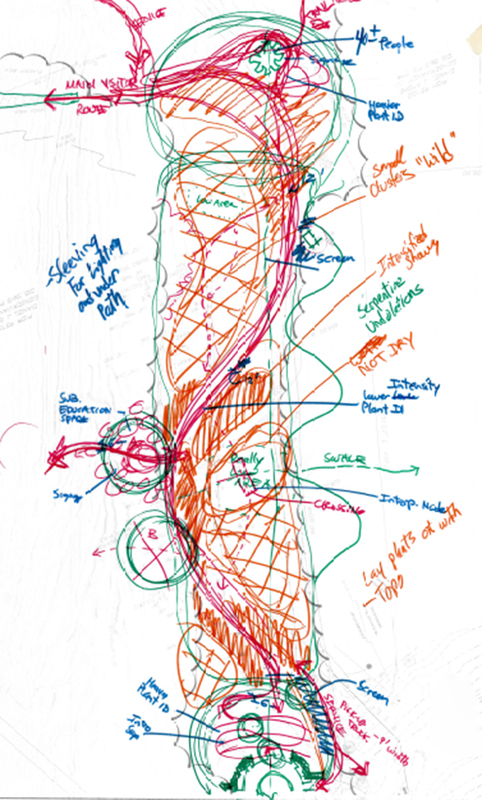 Fromme collaborated with the Garden and Siteworks Studios to develop an innovative design showcasing native prairie grasses and forbs that might have once grown on the site. 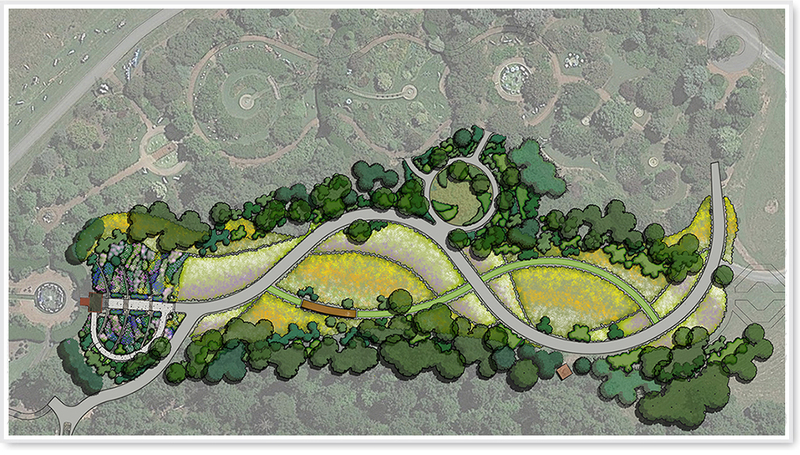 Fromme led the team in establishing a framework seamlessly integrating the Prairie with the existing gardens while creating a beautiful new horticultural attraction. 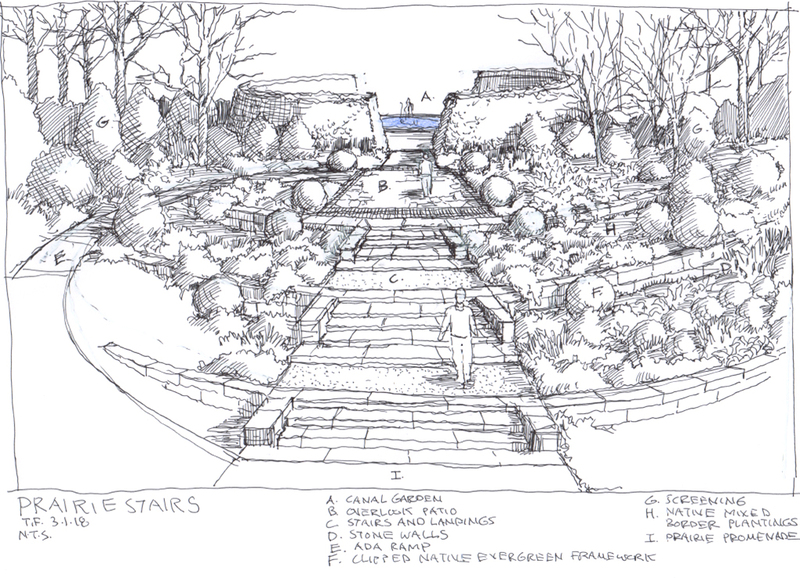 Stately stone stairs seamlessly transition from the existing Canal Garden’s rectilinear geometry into the naturalistic Prairie. A ramp permits wheelchair and stroller access. Arcing walls echo the Canal’s circular grand pool and form a series of terrace mixed borders through which the stairs descend. 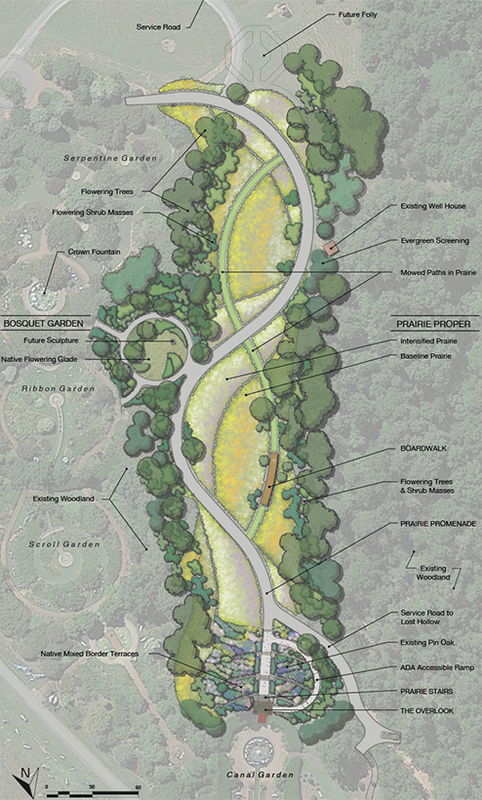 The sinuous main promenade leads to the proposed future Folly, a visible focal point, venue, and destination at the Prairie’s far southern end. The entry terraces contain traditional gardenesque compositions and showcase cultivars of North Carolina and regional natives. Plantings along the main path become increasingly naturalistic and include concentrations of the showiest and longest blooming of the indigenous prairie species which become more diverse at a distance from the path. Cultivars and hybrids of native Flowering Dogwoods, Redbuds, and Azaleas stage an unforgettable spring display along the Prairie’s eastern edge adjacent to the existing Perennial Gardens. Native versions of the same plants weave in and out of the western perimeter. Deciduous shrubs with brilliant fall color and evergreens with winter fruit extend the seasons of interest.